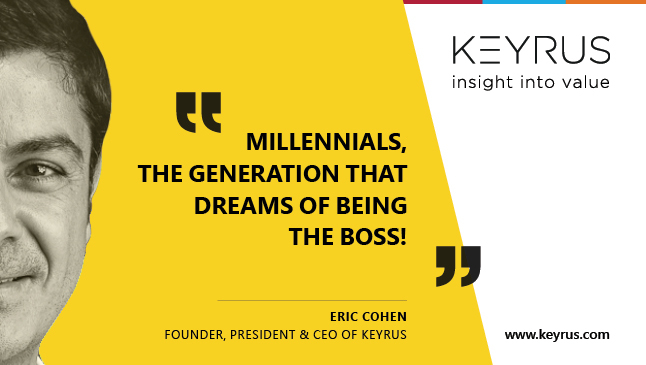 KEYRUS | Op-Ed article by Eric Cohen - Millennials, the generation that dreams of being the boss! Op-Ed article by Eric Cohen - Millennials, the generation that dreams of being the boss! We are living in uncertain and exciting times. The Y and Z generations, also called Millennials, are torn between the increasingly elusive job security of salaried employment and the promise of freedom offered to them by the possibility of being an entrepreneur. The many recent studies on 18- to 34-year-olds and their view of work confirm this: their expectations in terms of autonomy, fulfillment, flexibility and creativity clearly tip the scales in favour of entrepreneurship. Many Millennials dream of being their own boss and bringing their ideas to life. The only real obstacle to overcome – especially in France – is the risk-taking factor. Its uncivilized name hides a very real fact: atychiphobia is the scientific name given to an abnormal fear of failure. It is above all a cultural problem. Right from a very early age the French schooling system develops in us a fear of low marks. It is therefore in no way surprising that one of the main factors cited as holding people back from setting up in business is the fear of failing (24% of individuals surveyed, according to the French Entrepreneurial Index, a new tool for measuring entrepreneurial dynamism in France – February 20161). Yet, as Steve Jobs so aptly put it, "I'm convinced that about half of what separates the successful entrepreneurs from the non-successful ones is pure perseverance". One fear can hide another… that of succeeding. The fear of success is more difficult to recognize and detect in itself because it seems illogical. Yet, our culture sets for us strong taboos that are rarely conscious. In France, a person's success does not necessarily sit well with others and can arouse more suspicion and criticism than it does admiration. Fortunately, these cultural obstacles are on the wane, all the more so since the advent of the Internet and NICTs that enable us to communicate without borders. It is no accident that the Digital Natives – born with a computer or a mobile in their hands – are much more inclined to choose the path of entrepreneurship than their elders. They have a taste for setting out to discover other things, challenging conventions, and looking at how things are done in other countries. Whilst it is true that the fear of failing or succeeding, combined with the administrative complexities typical of France, have discouraged more than a few in the past, this is less so now, as we witness nothing short of an explosion in start-ups, particularly in High Tech, aided by several semi-private initiatives2 and the support of seasoned entrepreneurs who managed to succeed in France at a time when it used to be even more difficult. There is a real desire to "hand over the baton" in concrete terms and silence the French-Bashing critics who claim that France is a nightmare for anybody setting up a business. It is impossible not to mention Xavier Niel, the creator of Free/iliad, which is financing the world's biggest start-up incubator called "The Hall of 1000 start-ups", due to be inaugurated at the start of 2017. Mohed Altrad, the President and CEO of the Altrad Group and winner of the EY 2015 World Entrepreneur of the Year Award, is now offering his experience for the benefit of the France Entrepreneur Agency3. Just recently, the Secretary of State for Higher Education and Research launched a digital media campaign4 designed to promote the still insufficiently known status of student entrepreneur. This status allows students to undertake their project to set up in business whilst studying, and young graduates to retain or regain their student status and the advantages that go with it. So, despite the current difficulties associated with salaried employment, the context has rarely been so favourable for the creation of businesses in France. Let us wager that Millennials will manage to do well out of it all and shrug off old cultural barriers. 2 French Public Investment Bank (BPIFrance) and French Tech initiatives detailed in the editorial by Eric Cohen entitled "France, the new cradle for digital entrepreneurs"